An Australian senator is expected to propose legislation which would recognize the international marriages of gay and lesbian couples. Greens Senator Sarah Hanson-Young said she would introduce the bill next month. The move comes a day after nearby New Zealand approved a gay marriage bill. Despite polls showing a large majority (60%) of Australians support marriage equality, a marriage bill was defeated in parliament last year. 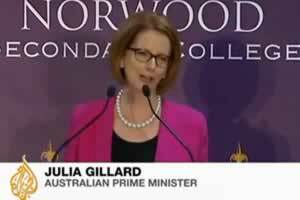 Shortly after Wednesday's vote in New Zealand, Australia Prime Minister Julia Gillard, an opponent of marriage equality, said she was unmoved. “I doubt we're going to end up agreeing,” she said. New Zealand's law will take effect in August.